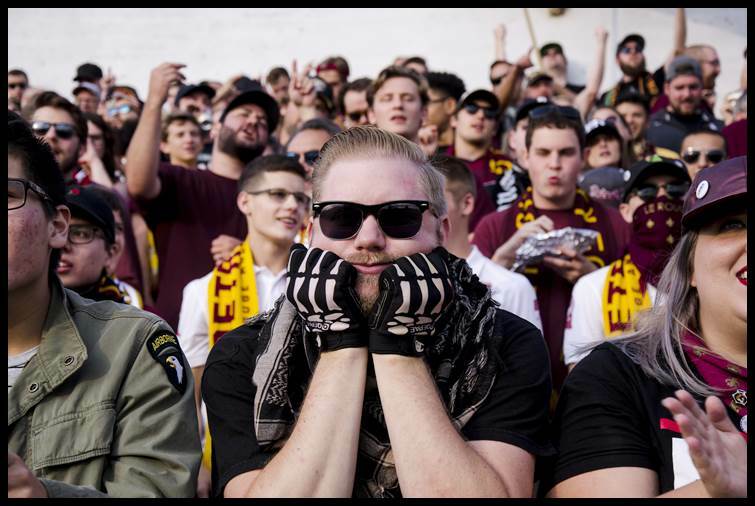 It was a bittersweet finale for the Detroit City Football Club last weekend. But the team capped a sweet, sweet season by performing magnificently in the post-season, and also managed to set a record in attendance during Saturday’s final game. 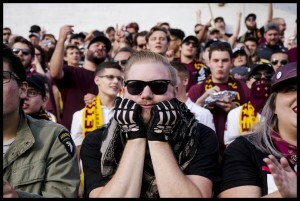 It was bitter, perhaps, because of the sudden death loss, but fans had little to complain about considering DCFC’s players performed like champs, winning all of their postseason outings. Even in their loss the team played well. Detroit’s rival, the Texas Midland-Odessa club, came out on top after the two teams wound up scoreless during regulation time and two 15-minute overtime periods. 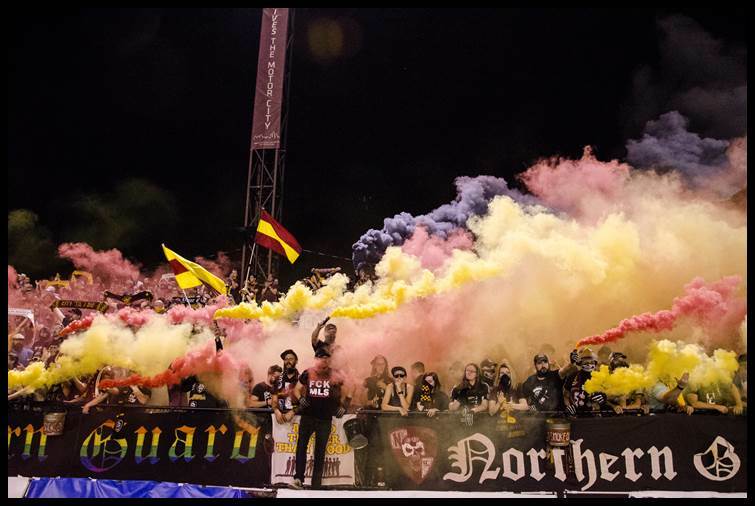 The DCFC’s last best chance to win came in with a goal attempt in the 117th minute of the game that was snagged by the Midland-Odessa goalkeeper. 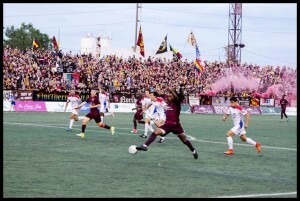 The DCFC lost its final game 4 goals to 2 in front of a record-setting crowd of 7,533 — which eclipsed the club’s previous attendance record of 7,410 fans — who showed up for the team’s inaugural game in 2016 at the then-newly renovated Keyworth Stadium. 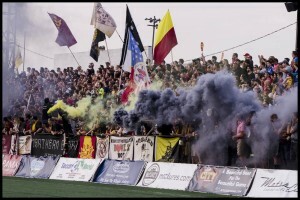 David Dwaihy, DCFC co-owner and player, said the intensity of the fans paired with the intensity of the game itself made the match-up sizzle and served as a near-perfect ending to a stellar season. 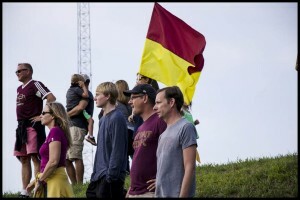 Also watching the game Saturday was Michael Rehfus, the former owner of Urban Break coffee house on Jos. Campau. He now lives in Columbus, Ohio with his wife and two children. He made the four-hour drive here with his son, Milosz, who is a big soccer fan, and still feels connected with Hamtramck. Milosz moved from Hamtramck when he was 3 years old. 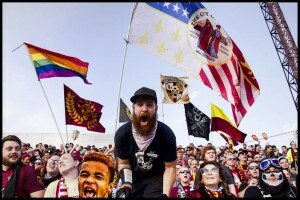 “We marched through the streets and into the stadium with the supporters and cheered along the whole match. I lived on Jacob Street for years, and marching past my old place with the cheering, chanting supporters put a lump in my throat. 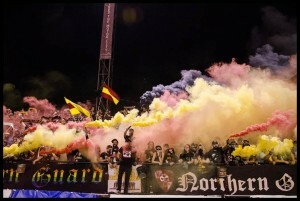 “By the end we were hoarse from singing and bleary-eyed from the smoke bombs. It was such a fun, exhilarating experience, it almost made up for the loss –almost. Also part of the game experience is watching the fans. 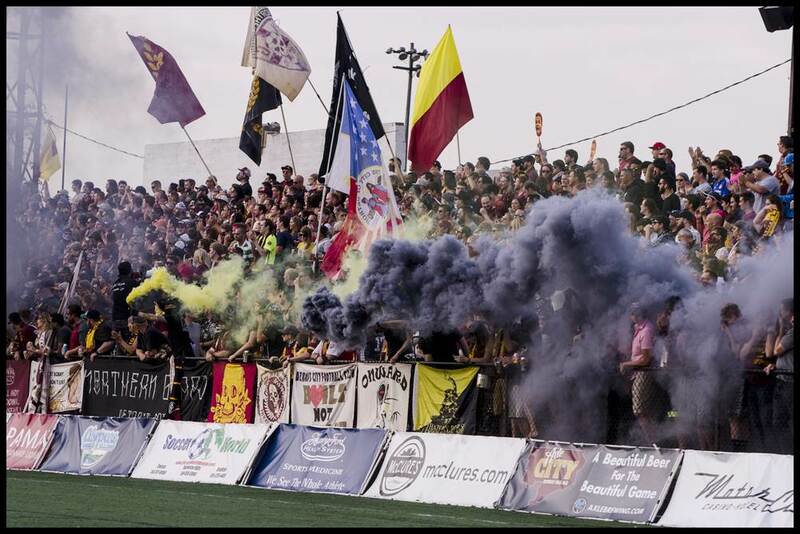 “The size and composition of the crowd was stunning. Clearly younger, and definitely drawn from a wider swath of Metro Detroit,” Rehfus said. 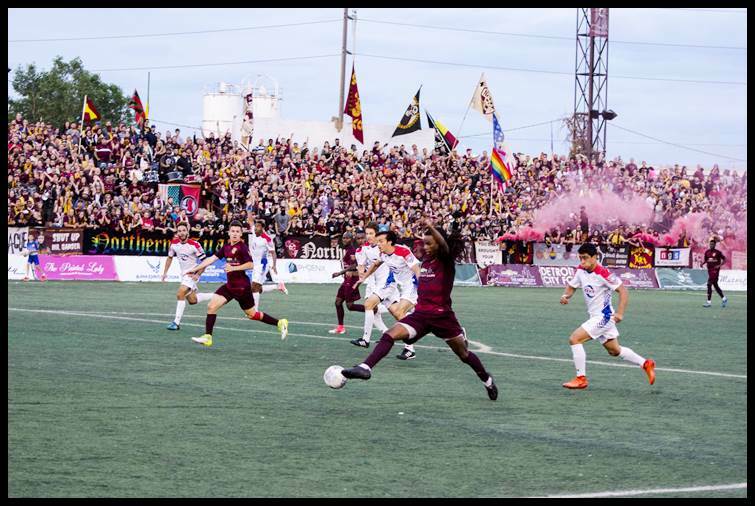 The team has pumped hundreds of thousands of dollars into renovating Keyworth Stadium. Fans have also boosted local bars and restaurants after the games. “I’m very happy for Hamtramck Public Schools, DCFC, the City of Hamtramck and Hamtramck’s businesses that benefited financially from Le Rouge fans patronizing their establishments,” Niczay said.